I think I put together a really great esoteric tonight. We'll take a look at a bunch of different stats. Have to thank Adam over at Growing Up Islanders Blog for "taunting" me to look at the Isles versus Rangers Numbers. Check out Adam's blog at www.mvn.com/growingupwiththeisles. We had 4 players have a multi-point game tonight. For only the second time this season we had a player score 3 points. For only the third time this season we have had someone score 2 goals in a game. No Hat Tricks yet this year for the New York Islanders. To put this all in perspective let me spell it out for you. 4 players with multi-point games equates to 1% of all the opportunities this season. 7.6% is defined as the 33 players to have multi-point games out of all the 432 possible opportunities for it to have happened so far this year. You come up with 432 possibilities by taking 18 spots per game multiplied by 24 games played. In other words, 92.4% of the time players have had a single point game or less so far this season. 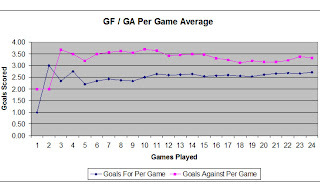 GF versus GA per game; New York Islanders versus the Rangers. This will be broken down by removing all shootout goals. The NY Islanders are up on the Rangers in the GF per game category 2.63 Goals scored per game to the Rangers 2.54 Goals per game. Where the Rangers do real better is the 1 less goal per game against. Isles give up 3.30 goals per game and the Rangers give up 2.30 goals per game. HILBERT had a 2-point night tonight. He has played in 175 games and is now in the top 100 all-time in games played, tied with Ken Baumgartner. His Goal is his 21st which ties him at #84 with Bill Berg. His Assist is his 35th and ties him with Bill MacMillian at #104. He is now firmly in the top 100 all-time for points with 56 Points. He is tied at #97th with Mathieu Schneider and Billy Carroll. MEYER is the second person with a 3 point game this season and the third to score 2 goals. Tonight was his 97th Game and ties him with the younger Tambellini at #145th overall. His 2 goals gives him a total of 6 with the Islanders and jumps him from #193rd overall to tied for #163rd. His 14th Assist ties him with 11 others including SUTTON for the #158th spot. His 3 point night gives him 20 total points for #161st tied with Terry Crisp, Dave Fortier, Garry Galley, Robert Nillson, and Reed Larson. HUNTER also had a 2 point night in his 350th game with the team. He is 31 games behind Randy Wood to take over the #38th spot. His 83 Goals ranks him #33rd a mere goal behind Tomas Jonsson. Trent now has 102 Assists for the #44th spot only 3 assists behind Jude Drouin. He is in sole possession of the #38th ranking on the all-times points list with 185 Points. He breaks a tie with Lorne Henning (543 GP) and 3 Points behind Jeff Norton (282 GP). SIM had a single point game. This being his 26th game with the team ties him at #270th with Troy Loney, eric Manlow, and Neal Coulter. His 3rd Assists for #267th ties him with a bunch of others. His 8th point ties him for #232nd, again with a bunch of others. 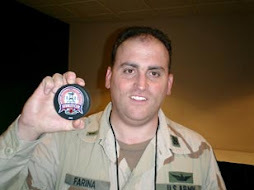 His game misconduct tonight got him 10 PIMs and a total of 30 PIMs as an Islander, tying him at #212th with Butch Goring and 4 others. He is the 217th player with at least 30 PIMs. SUTTON is another that had a 2 point game tonight. His 74th game ties him at #183rd all time with Mathieu Biron, Rob DiMaio, and Aris Brimanis. His 2 Assist night ties him with Meyer and 11 others at #158th with 11 Assists. The 2 Assists also means 2 Points for a total of 15 points on Long Island. This ties him at #186th with Ryan Smyth, Kirk Muller, Blake Comeau, Doug Rombough, and Michel Bergeron. His 2 PIMs tonight gives him a total of 110 Pims for #78th tied with Sean Hill. CAMPOLI only had a single point game. Chris has now played in 196 games for the #89th spot. he is 3 games behind Ralph Stewart and 4 games behind Billy Carroll. His Assist is his 55th. He is in sole Possession of #73rd and breaks the tie with Rich Pilon (509 GP) and is 3 Assists behind Aaron Asham (300 GP). His 72 Points gets him to the #78th spot, 2 points behind Martinek and 3 points behind Tim Connolly (103 GP).